Ayutthaya Bouchic Hostel is conveniently located in the popular Ban Pom area. The hotel offers a wide range of amenities and perks to ensure you have a great time. Free Wi-Fi in all rooms, Wi-Fi in public areas, car park, coffee shop, shops are there for guest's enjoyment. Guestrooms are designed to provide an optimal level of comfort with welcoming decor and some offering convenient amenities like additional bathroom, additional toilet, internet access - wireless, internet access - wireless (complimentary), non smoking rooms. The hotel's peaceful atmosphere extends to its recreational facilities which include garden. 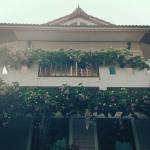 Ayutthaya Bouchic Hostel is an excellent choice from which to explore Ayutthaya or to simply relax and rejuvenate.